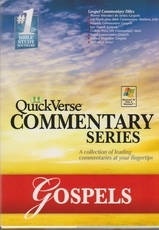 QuickVerse Commentary Series contains most popular commentaries with over 40 reference works to provide you the most complete in-depth Biblical research software. Commentaries, Bible dictionaries, pictures and devotionals are just a sample of the references that will be at your fingertips . . . From word study to simple daily reading plans . . . word pronunciations, sophisticated searching, completely automataic multi-window text synchronization, detailed commentary covering every verse of the Bible , notes, bookmarks, highlights, word processor integration and more!